C.P. Browne photo taken in Cairo. From his family in 2012 (Alan Dummett and Lorraine Lowry). C.P. 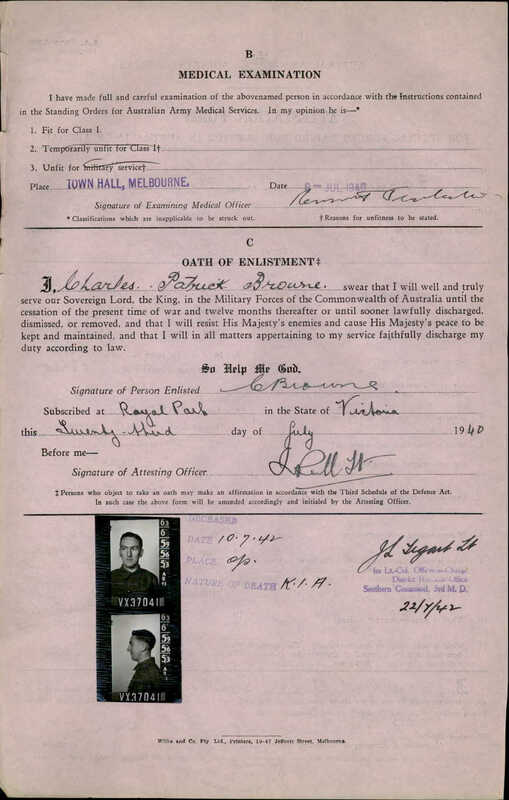 Browne - Oath of Enlistment. This took place on 23 July 1940 at the Town Hall, Melbourne. Photo from his family in 2012 (Alan Dummett and Lorraine Lowry). C.P. 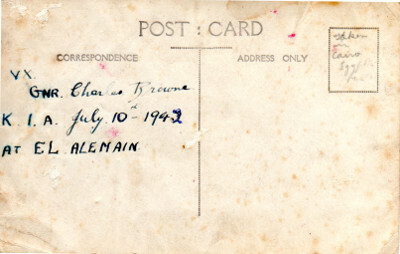 Browne - reverse of his photo. According to the text the photo was taken in Cairo. Photo from his family in 2012 (Alan Dummett and Lorraine Lowry). Gravestone of C.P. 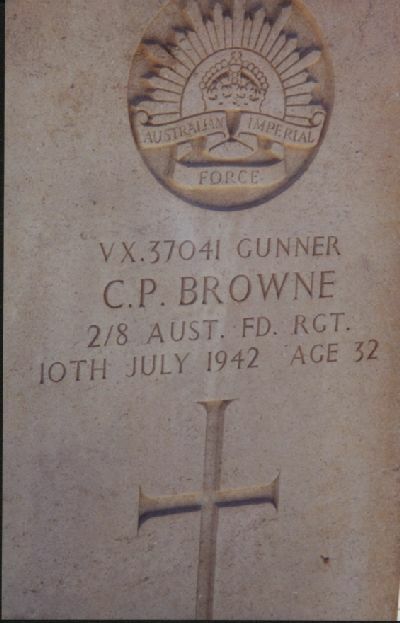 Browne at El Alamein. Photo taken 2007? by Geoff Bydder. 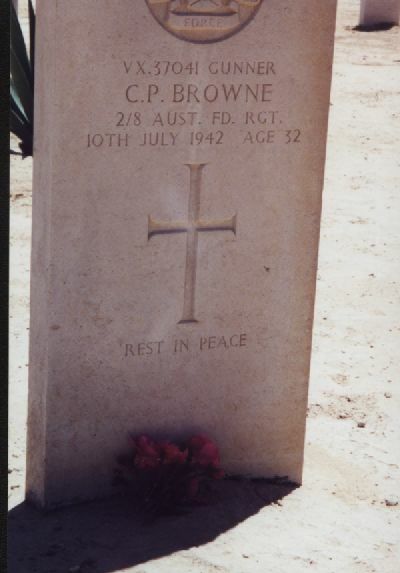 “Charlie” Browne is known to be the first casualty of the Regiment at El Alamein. As Batman to Col. Crisp, he was killed in action on 10th July 1942 when the vehicle he was driving took a direct hit - he was aged 32. Charles was born in Coburg, Victoria on 4th November 1909. He was a single man, aged 30 years and 4 months, when he enlisted on 23rd July 1940. A printer by trade, he lived with his mother in Mozart Street, St. Kilda – an inner suburb of Melbourne. 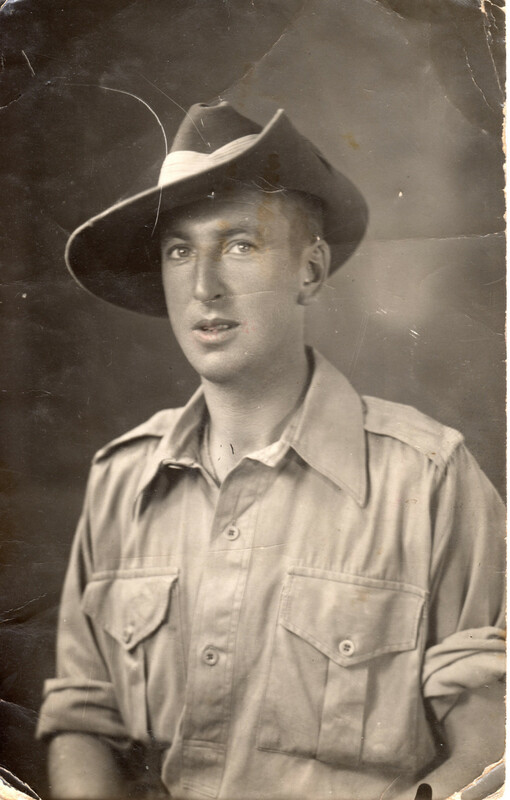 Charles was originally attached to the 2/2nd Medium Regiment at Puckapunyal and was later transferred to HQ RAA – 9th Division on 17th October 1940. He embarked from Melbourne on HMT “Stratheden” exactly a month later, on 17th November 1940, arriving in the Middle East on 17th December of that year. He was dispatched directly to Palestine, where he was later transferred from HQ Artillery to HQ 9th Division on 7th March 1941. On 16th June 1941, Charles was transferred to the 2/8th and detached for special duties as Batman for the C.O. on 1st November 1941, rejoining the Unit eleven days later. He was evacuated to 7 AGH on 3rd December 1941 with middle ear infection in both ears, remaining in hospital until 23rd December when he was detached to the Artillery Training Regiment for five days before returning to his Unit.